DO NOT BUY A PUPPY FROM A PET SHOP!  Do you really want to take on all that extra responsibility?  If you don't own your house, are you allowed to keep pets?  Dogs need a regular routine – are you able to offer this every day?  Will the dog regularly be left for several hours or long periods?  Have you added up the financial costs of owning a dog?  Is anyone that will be living with the dog allergic to or scared of dogs?  Does everyone in your family want a dog?  Do you have time for a dog?  Do you have any other pets that might not get on with the dog?  Are you aware of the legal responsibilities of owning a dog?  Which Dog Should I Have?  Are you allergic to dogs? Rescuing a dog from a shelter is a wonderful way to give a dog a second chance at life, and find yourself a new best friend. But, how do you help start this new relationship off on the right paw? This FREE Guide walks you through the first seven days of adopting a rescue dog. 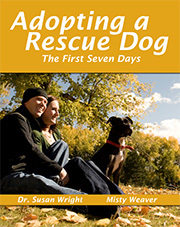 Veterinarian Dr. Susan Wright and Editor Misty Weaver take you through the first seven days, from selecting a dog that will be a good fit with your family (Chapter Four) through to establishing routines (Chapter Seven), and socialization (Chapter Eleven). Each chapter ends with a real story from a family that adopted a rescue dog, sharing with you the joys and the challenges that accompany any adoption. As you and your dog work together to find a new rhythm together, this guide provides you with the tips and tricks that will make your adoption a little easier and smoother for both master and dog. With some work, a bit of good advice, and a lot of love we know you will change two lives for the better. For more information and instructions on how to download your copy (100 pages PDF file 2Mb) click here.